Before being dismantled in 1993, Kowloon Walled City was believed to contain the highest population density of humans anywhere on the planet. At only 6.5 acres (~0.01 square miles) in size, over 33,000 residents were thought to live within its walls. For comparison, San Francisco’s Moscone Center West, where Apple famously holds its WWDC keynotes every year, is only ~4.5 acres in size. Kowloon Walled City had a complicated history. It was initially founded as a Chinese military fort during the mid 1600’s. The fort itself was located on Hong Kong Island and was ceded to the British in 1898. After World War II, squatters begin to occupy the fort and build new settlements. After failing to prevent further habitation and construction, both British and Chinese officials turned a blind eye to its existence. Eventually, sanitary conditions and subpar standards of living forced the British and Chinese governments to evict its residents and begin demolishing the city in 1993. Today, Kowloon Walled City Park occupies the original site of the city. For an idea of how dense the population of Kowloon Walled City was and how it compares to other cities in the world, Wikipedia has lists featuring the highest population densities in the United States and highest population densities in the world. Gutenberg, New Jersey is the densest United States town, with 56,000 people per square mile. Marine Division in Mumbai, India is currently the densest human inhabitance on earth, with ~300,000 people per square mile. 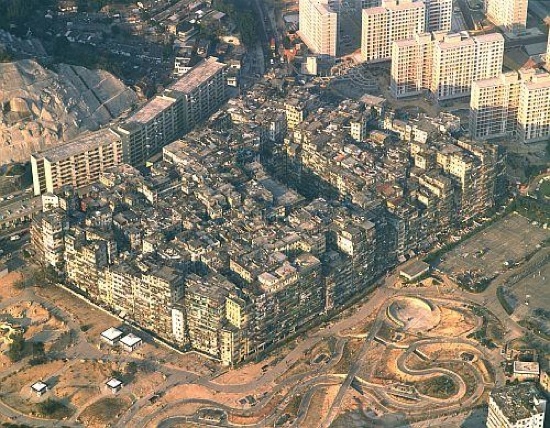 Kowloon Walled City had a population density of 3.3 million people per square mile! Insane! The images of the Walled City and its seemingly random and haphazard construction remind me of the haunting photos of Battleship Island, which we’ve previously written about.